It’s comfortable, stayed warm when camping in the 20s. Packs up nice and small. Perfect for backpacking. Have taken this bag on extended backpacking trips and it met all my needs. Kept me warm even when it was in the 20s. It was lightweight in my backpack and always fluffed up nicely when I took it out of the stuff bag. Love the shape as it gave me extra wiggle room. The foot box gave me extra warmth right where I needed it. 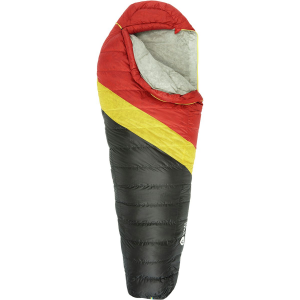 Been backpacking for over 50 years and this is by far my favorite sleeping bag. Welcome to Trailspace, Patricia! Thanks for sharing a review of your Nemo bag. 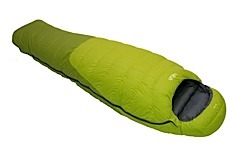 Perfect backpacking bag for side/stomach sleepers. Incredible comfort and weight. While you can certainly get lighter and more compact (for a price), the uniqueness of this bag made it an easy choice. Being a stomach/side sleeper, I struggled with my mummy bag over the years. This easily solved that issue and it was very easy to move around from side to side. 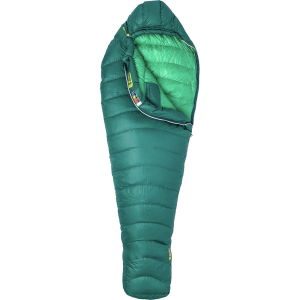 The zipper vents on top are also brilliant as I often camp in the summer. Usually I just climb out and sleep on top. Thanks for the review, DWEST. How long have you had your bag?